Force Friday II, September 1st, is the time Star Wars Fans Find the Force at special retailers! This global augmented reality (AR) event is to commemorate the worldwide launch of new products inspired by Star Wars: The Last Jedi! During this three-day event, at over 20,000 retail locations across 30 countries, we can join the battle against the dark side. Along the way, we can take home new The Last Jedi products and activate an awesome AR experience featuring some of our favorite Star Wars characters plus new character reveals! Alarm set! Our Disney Store is opening early and I plan on being one of the first 100 guests in the store for that free poster!! What are your Force Friday plans? Visit any of the 20,000 participating retail locations to find a graphic that contains the Find the Force logo. Scan the graphic with the app and reveal a character, who through AR, will show up in the room with you. Each day, you can reveal new characters, 15 in total across the 3 days. Take photos, record videos, and share on social using hashtags #FindtheForce #Sweepstakes for a chance to win the ultimate fan experience: tickets to the Star Wars: The Last Jedi premiere!! 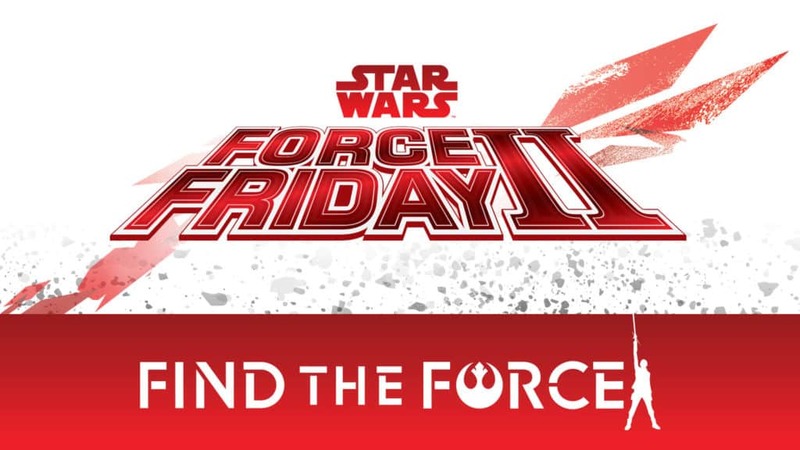 Get more details on Find the Force and Force Friday II here. The Last Jedi is in theaters December 15th!! Previous Post: « Disney On Ice Presents Dare to Dream! We are so excited! My son can’t wait to participate and see what characters we will find! Although I’m not an avid Star Wars fan, but I can definitely see the appeal of this event. I love seeing the Star Wars fans excitement every time a new promotion happens! AS a Star Wars family, I’m ashamed to admit I didn’t know this was a thing! I definitely need to investigate further and plan accordingly! I am a Star Wars junkie! I am so eager for Find the Force. We are going to Disney next week. I wonder how many of their retail locations will have it? I know a number of people looking forward to the next movie. I still have 3 or 4 of them to watch before I could contemplate tackling a new one, I’ve only seen the first 3 released. My daughter is a huge Star Wars fan. I am sure she is excited about this movie. We might have to do this! My entire family are Star Wars fans and this sounds like fun. We can’t wait for the new Star Wars movie. Wow how exciting!My son and husband may enjoy this. I had not heard about this until now. I always wished to be a star wars fan to be able to join in on the obsession, but I could never get in to it! Glad this has came along for you though! My brother and nephew are both huge Star Wars fans! I don’t think they know what’s happening tomorrow, but thanks to you I’m now in the know. I’ll be sending a text message their way with the URL to your blog post! OMG I didn’t even know this thing existed! My husband is going to go crazy about it, I am downloading the app as we speak! Thanks! I do follow up star wars back then as a teenager, All there movies always has this vibe and excitement. My cousin is an avid Star Wars fan, so I know she will love this! This seems so cool! How funny! Star Wars fan sure are so exited! Will let know about this app to my husband, he will sure download it! OMG, I was not aware of this day! How bad of me who always claim to be a Star Wars Fan! I will check this out in more depth! This is out of this world! 😉 My husband – the ultimate Star Wars fan – has been so looking forward to this! I’m not at all a star wars fan nor I have seen any star wars episode. But my kids are obsessed. That is so cool that you could win tickets to the premiere! I should really get into Star Wars, so many people love it but I have yet to watch it. Ohh be there early, I am sure there are so many Star wars fans will go earlier that expected because of the free posters. Enjoy and take lots of pictures! Many fans will surely be there. My son is a huge fan of Star Wars. He is sooo excited. My hubby is a star wars fan so yes it would be exciting if he gets a ticket to a premiere. Sounds like a great event. I am no a Star Wars fan but this sounds fun. I so wish I had been able to see this post earlier. Although I am still not sure I could have made it with all the things that I needed to do. It’s been a bit crazy. Anyway, hope you got the cool poster and I am definitely looking forward to the Last Jedi later this year. Star Wars The Last Jedi is something I can’t wait to see with my family. I remember when Star Wars came out years ago. Thanks for sharing the information. Star Wars is a long term legacy series. This is going to be exciting come Christmas time.